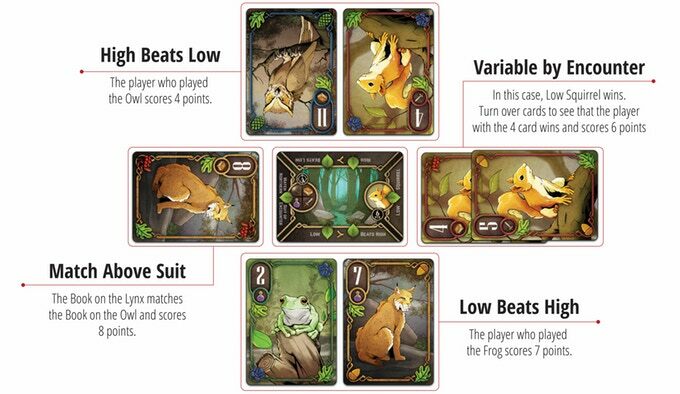 Into The Black Forest is an excellent twist on some simple trick-taking mechanics, blending the luck of the draw with layered strategic card play. 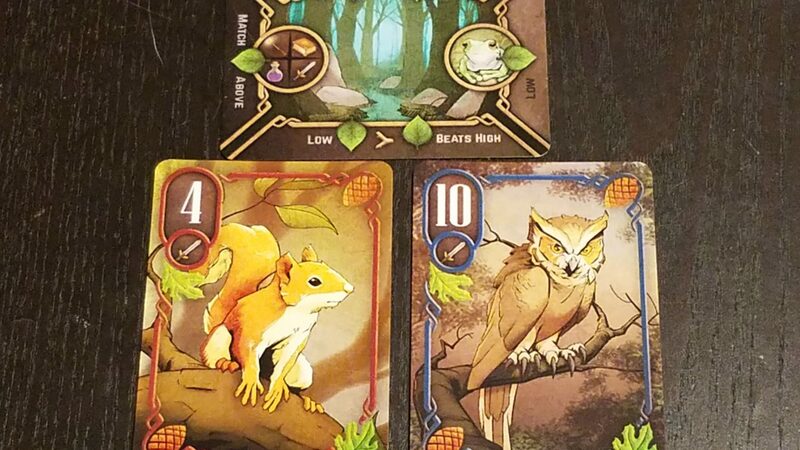 While accessible enough to engage as a quick game, Into The Black Forest is a touch more than a filler, with designer Jason Slingerland managing to squeeze a bit more out of these gorgeous cards than you might first assume possible. We here at Gameosity HQ love us some trick taking games. While modern game design abounds with brilliant ideas that stretch the definition of classic game structures, there’s always going to be room at our table for some of these tried-and-true mechanical cores, especially if they are accompanied by sweet art, clever design, and smart presentation. Into The Black Forest checks all those boxes. In its final week up on Kickstarter, we had the chance to put Into The Black Forest through its paces, and we’re really glad we did – what we have here is a game that feels like a ‘new classic’ in its approach. Want to see more? Well, wrap your cloak tighter around your shoulders as we venture Into The Black Forest. Kickstarter Prototype Alert! – We received a preview copy of Into The Black Forest for the purpose of this article, with the option of requesting a finished copy later. Because the art style of the game has changed since our prototype was created, we are primarily using images from the Kickstarter page. 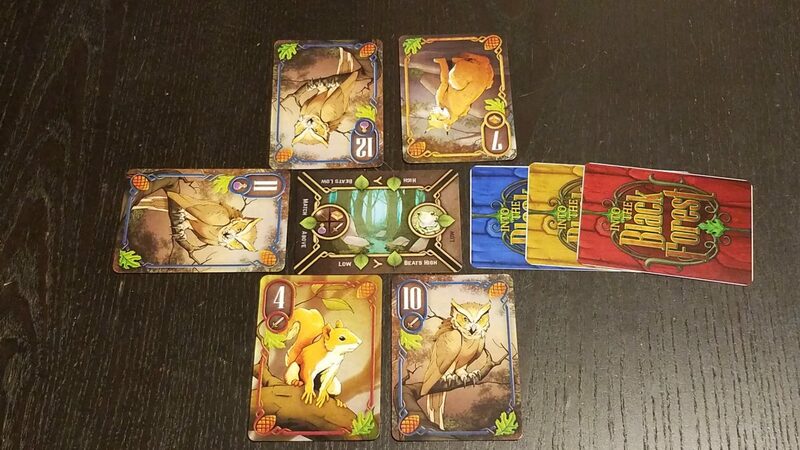 In Into The Black Forest, each player will manage their hand of cards as they try to score the most points along their journey through the titular wood. Worth noting, Into The Black Forest is really an abstract – the theme exists to add aesthetic beauty, and it does so quite nicely. However, an adventure game this isn’t, so if you go in thinking that there will be exploration, quests, or anything similar, you’ll be disappointed. Easy enough, right? Well, where the strategy of Into The Black Forest comes in, and what makes it brilliantly more engaging than it has any right to be, is that since each player is only playing one card at a time, you need to be smart with not just which card you play where, but which card you play when. For example, your opponent plays a 3 into the ‘Low Beats High’ area. Well, they’re likely to win that spot, sure, but the hitch is that they will score points equal to the higher card played into that area. So you still need to pay attention to what card gets played into that ‘losing’ space – if someone ends up being forced to dump a high card there, that’s a pile of points that goes the winner’s way. So you might be forced to throw in a card you might have used elsewhere, a 4 or 5, in order to mitigate those points. Whoever played that 4 made out like a bandit this round. And of course, if you’re doing that, you’re not placing your own cards for your own win, and so there is a constant cost/benefit analysis with each play, which gets tighter and tighter as your hand empties over the course of the round. We really enjoyed this simple strategic snarl, and actually felt it worked great at the 2-player mark, which was surprising to us given that trick-taking games don’t always function well at lower player counts. The 2-player game of Into The Black Forest is an even more strategic one, since you’re going to have more placements per-round, and we found it differently but equally satisfying to the 3-4 player experience. 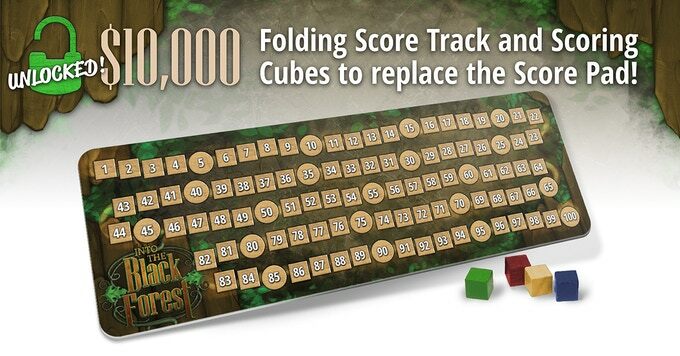 The first stretch goal, already unlocked, added a much-needed scoreboard to this little game. 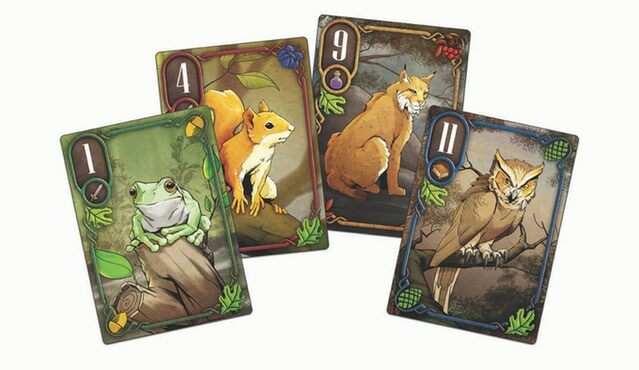 Like we said at the top of this preview, Into The Black Forest feels like a ‘new classic’ card game to us. It’s got a familiar core, and once you’ve played a round, you’ve seen the game in its entirety, and yet we kept having fun with it play after play for that very reason. Minor graphical improvements, such as clear iconography, have been added to this already gorgeous game. Add to that the fact that the already gorgeous cards have continued to have accessibility improvements based on community feedback (solving one of our only real gripes with the prototype ), and what you have here is a must-back game for anyone who loves quick, engaging card games. 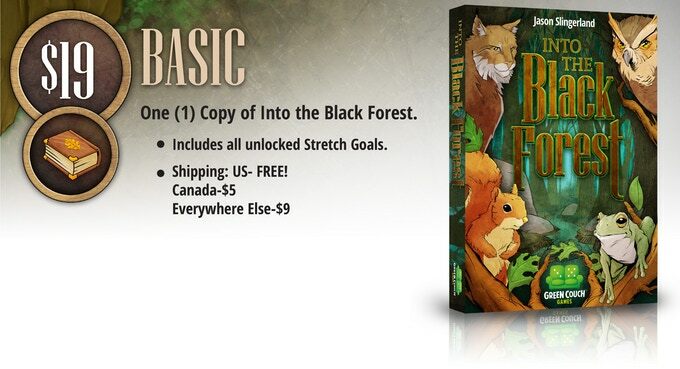 Into The Black Forest is in its final week of Kickstarter, so get yourself over to their campaign and check it out now!